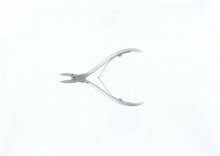 5" Stainless Steel Cutter/Nipper. Grooved Handle. Curved Blades. Leaf Spring. Autoclaveable. 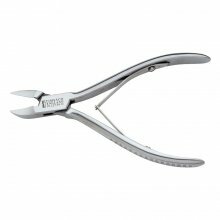 5.5" Stainless Steel Cutter/Nipper. Dovo style, curved with double spring. Smooth square handles. Autoclaveable. 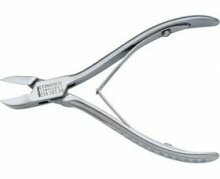 5.5" Stainless Steel Cutter/Nipper. Straight Blades.Smooth Handle. Double Spring. Autoclaveable. 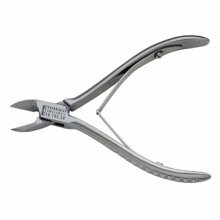 5.5" Stainless Steel Cutter/Nipper. Curved blades with double spring and locking handles. Autoclaveable. 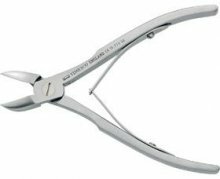 6" Stainless Steel Cutter/Nipper. Curved blades with double spring and locking handles. Autoclaveable. Large curved nail clipper with small file attached. Excellent value. Compare and Save.